Quitting smoking, alcohol, soda, and/or chewing tobacco is a great challenge. 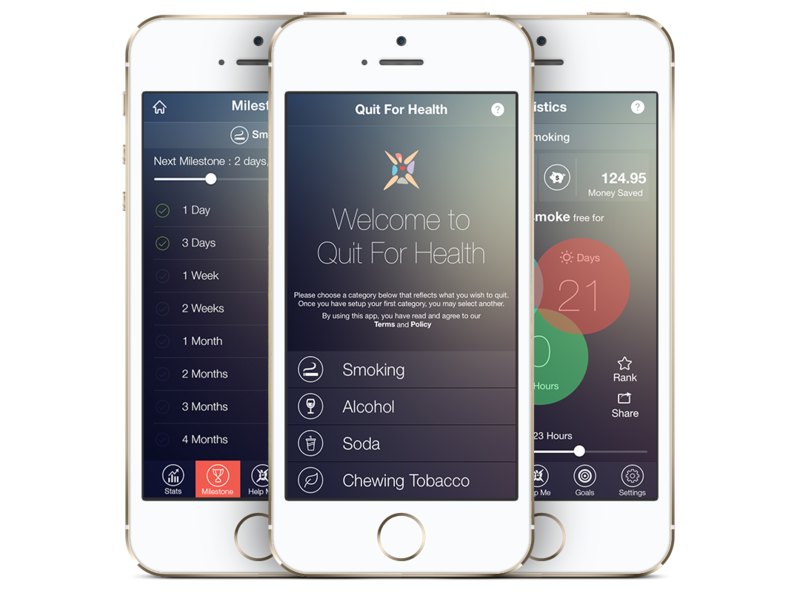 Let the Quit For Health app help you quit to live a longer healthier life. Quit For Health will present you with lots of information that can help motivate you to stay clean and to quit the habit for good. Knowledge is power! Keep track of your progress by years, days, and hours. By seeing progress, this can help give you the motivational boost to keep the counter going. Milestones are set to help you stay strong and focused on reaching the next milestone. This will give you self-confidence and a reward to yourself. Set goals for yourself such as notes and/or images that are motivational to you. Easily reference back to them whenever you are craving to remind yourself of your goals. Your health is important. By taking the steps to quit smoking, alcohol, soda, and/or chewing tobacco, you are greatly improving your health.Your body will thank you! Join our community to share your advice, tips, or just ask for help! Talk with quitters from all around the world to help you kick the habit! Quit For Health is packed with many features. Here is a glimpse on some of them. Ask questions, give feedback, or just say hi! Quit For Health is a property of Dandachli, LLC © 2014 All Rights Reserved.